Power Washing in Buffalo – Is It Worth Adding to Your To-Do List? With summer nearly here, we know how quickly home maintenance to-do lists can grow. Because of that, it’s important to start out by working through just the priority items, making sure you still have time on the weekends to kick back, relax, go hiking, antiquing, or whatever else you might be into. If you are considering power washing your home but it hasn’t quite landed on that “priority list,” we would suggest you make a little space for it. We have a few specific reasons why below, but we also would like to add that we can help! Be sure to give us a call at Paint of WNY with any questions you might have. Extends the Life of Your Paint – Yes, a little high-power water can actually increase the life and beauty of your paint. Why? Well, contaminants like mold, mildew, and dirt all work against the integrity of your exterior paint, breaking it down prematurely, and a thorough power washing will wash these away. 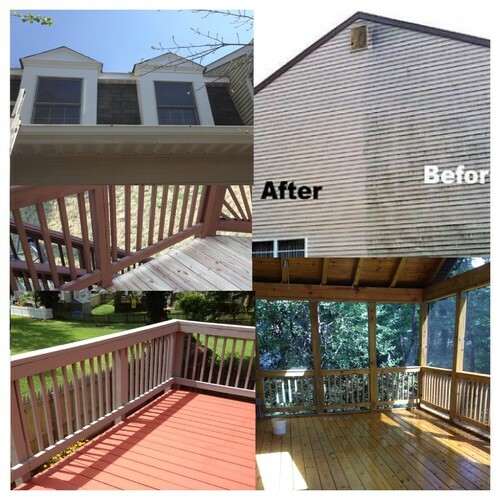 Protects and Refreshes Your Deck and Patio – For the same reasons listed above, washing your outdoor space is important. Reduces Slipperiness Around Poolside Areas – If you have a pool, you know how slick the walking spaces around it can become, especially as you first open it up for the season. Power washing can reduce this hazardous lack of traction, simultaneously helping to prep your pool for summer. Should You Tackle Power Washing or Hire a Professional? You can technically power wash yourself, either renting or buying a unit, but we would offer a couple words of caution. The process can be dangerous if you aren’t experienced. Many homeowners have underestimated the power of the equipment and water pressure, harming either the surfaces around their home or themselves. It’s easy to turn the corner from extremely beneficial to harmful very, very quickly. If you live in Western NY, why not give us a call at Paint of WNY? It would be our pleasure to serve you and your home this summer! Next Next post: How Do You Clean a Paintbrush? And Why Is It Important?